This series overlapped with and then superseded the Studio 33 albums, which Avenue had released over the previous year. 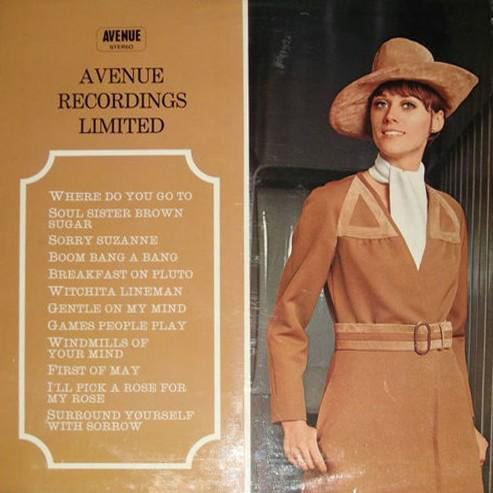 Avenue were so small that their early albums are extremely scarce, with scant distribution outside of the Greater London area - despite which they are among the most prolific in the field. Avenue’s covers albums have regular titles but these vary slightly over time. 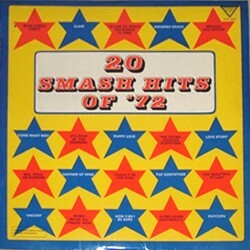 Many of them were also issued as two EPs, containing six tracks each, usually credited to former Tornados guitarist, Alan Caddy, who came on board in 1970. 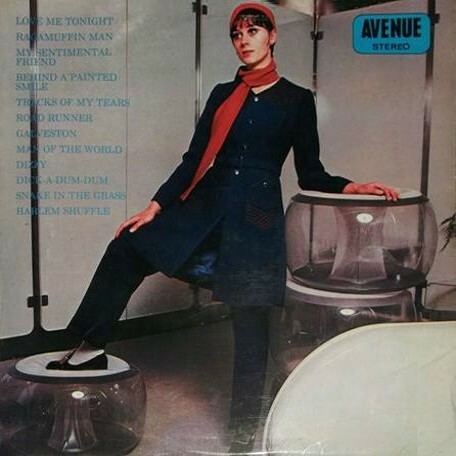 Caddy appears to be behind much of Avenue’s post-1970 output, although the extent of his involvement is unclear, since many of the Avenue tracks also appear in Marble Arch’s “Chartbusters” series and Caddy is not credited on any of those LPs - they are purportedly supplied by Dyne. 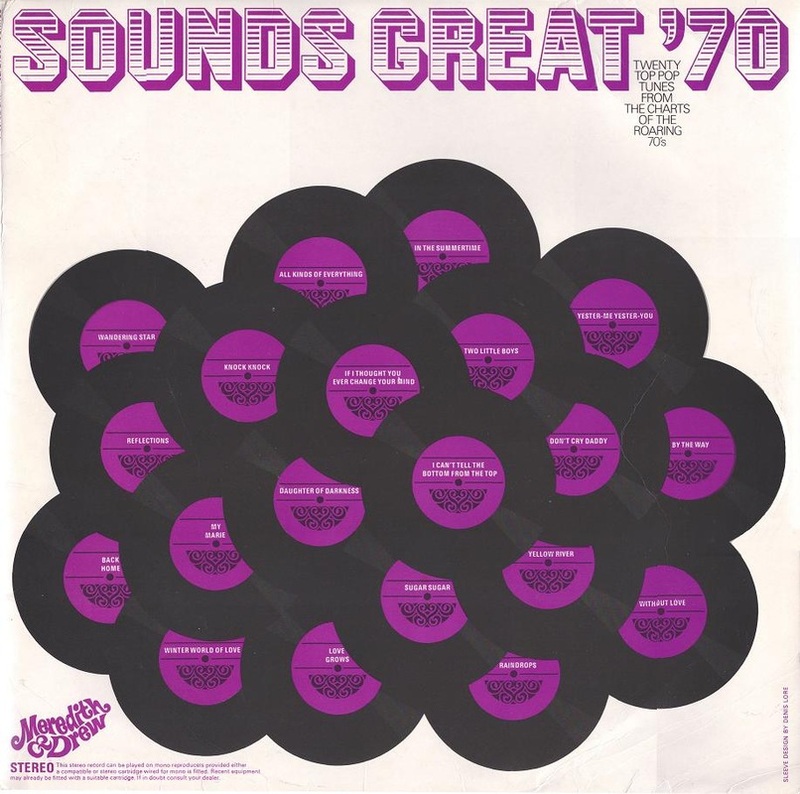 Avenue launched their Forest label (for EPs) and the Stereo Plus 3 label (for certain LPs) in 1972, in a vain attempt to better engage the public. However Avenue appear to have shut up shop in 1974, with Caddy moving to Canada. Nonetheless, the organisation was apparently reincarnated in 1978 as 5th Avenue, through the Artistry label - see under "Smash Tracks" for details. Comments: This is an Avenue label edition of an LP also released on the Studio 33 label. The cover art is identical, with just the label logo changed. Also released as two EPs. 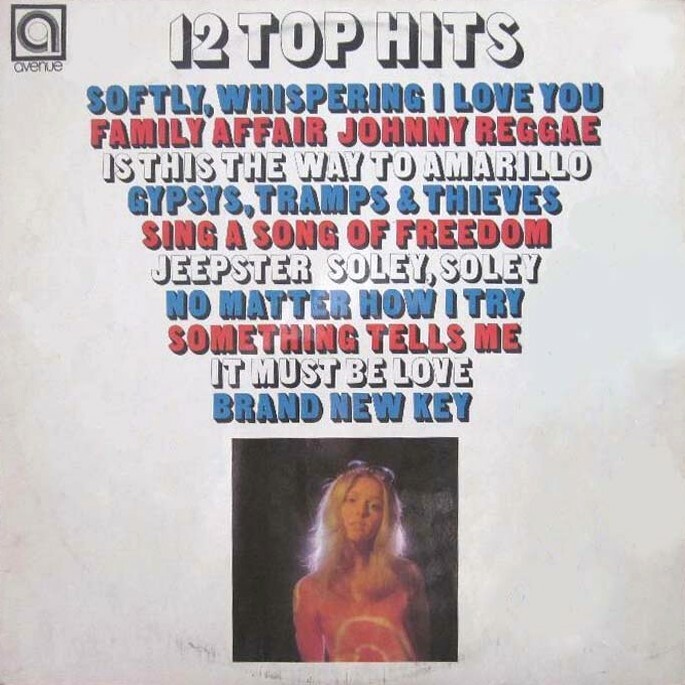 Comments: This is an edition of an LP released on the Studio 11 label as part of the overall Studio 33 portfolio (see separate page). 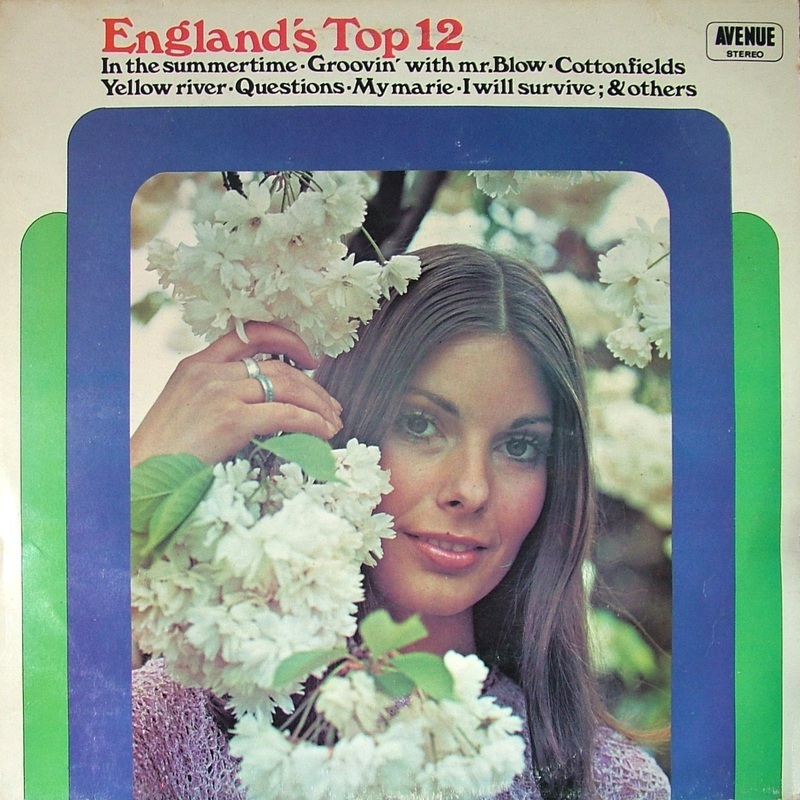 The cover art is identical, with the label logo changed, although the LP inside this Avenue sleeve also has Studio 11 labels. Album is titled "12 Hits". Also released as two EPs. Comments: The LP contents exactly match the contemporary Marble Arch LP, "Summer Chartbusters". Also released as two EPs. Copies are known with gold Avenue stickers where the logo is positioned on the front and back. It is thought that they were originally printed with a Studio 33 logo, either by accident or design. Comments: Also released as two EPs. Comments: Also released as two EPs. Featuring Elton John. Comments: Featuring Elton John. Also released as two EPs. Comments: Also released as two EPs. This album has the same contents as the Marble Arch LP, “Instant Chartbusters”. 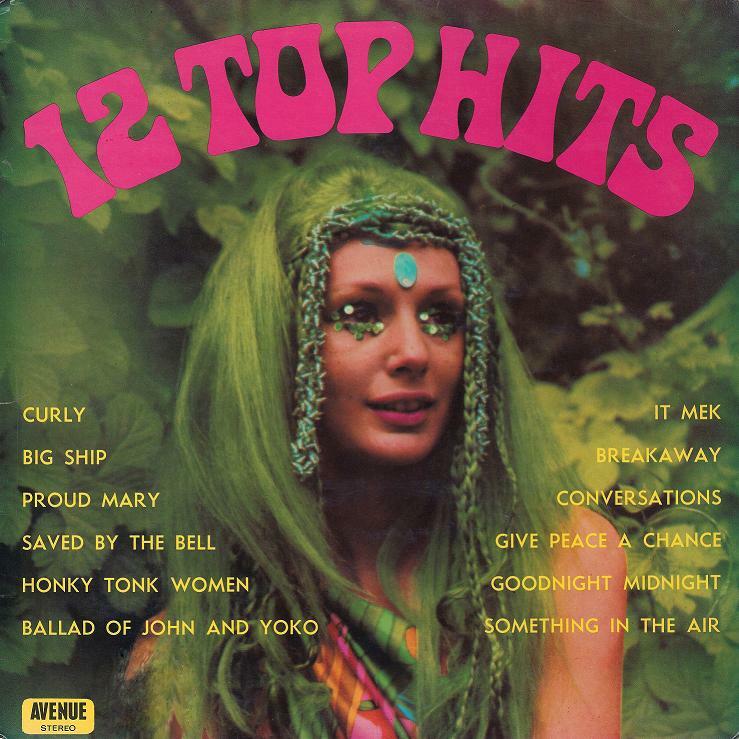 10 - "England's 12 Top Hits"
Comments: Also released as two EPs. Featuring Elton John. A Dyne recording. Comments: Also released as two EPs. First LP in the series to be recorded at Pye Studios. Featuring Elton John. This album has the same contents as the Marble Arch LP, “Chartbusters Again”. 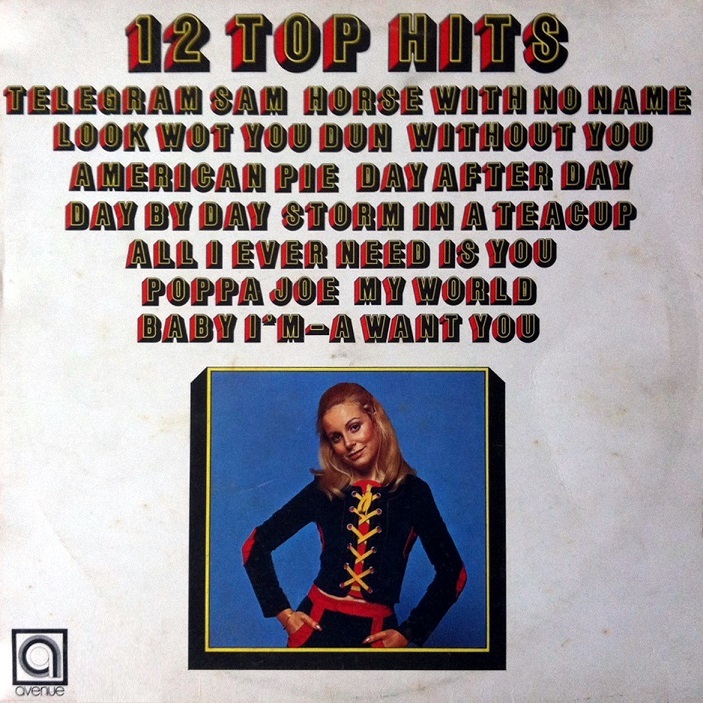 Note that "All Right Now" is missing from the track listing on the front. 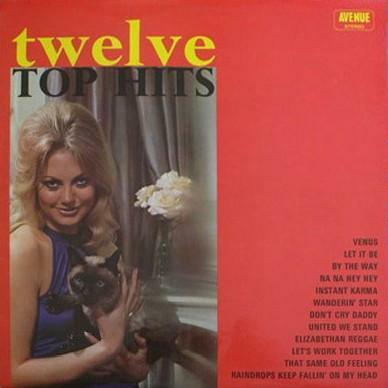 13 - "England's Top 12 Hits"
14 - "England's 12 Top Hits"
15 - "England's Top 12 Hits"
Comments: Also released as two EPs. The LP cover is the first of the “Arch” design series. Probably the last recorded at Pye Studios. 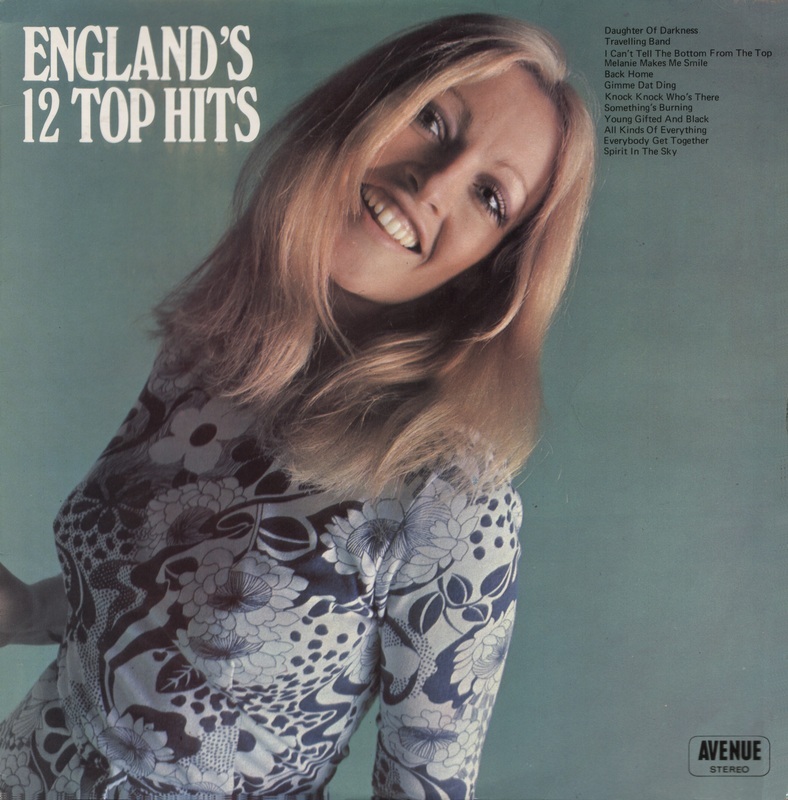 16 - "England's Top 12 Hits"
17 - "England's Top 12 Hits"
18 - "England's 12 Top Hits"
19 - "England's 12 Top Hits"
20 - "England's 12 Top Hits"
Comments: Also released as two EPs. LP cover is the last with the “Arch” design. 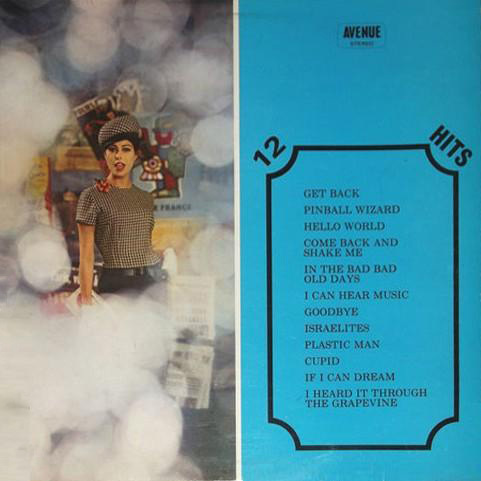 21 - "England's Top 12 Hits"
Comments: Also released as two EPs. 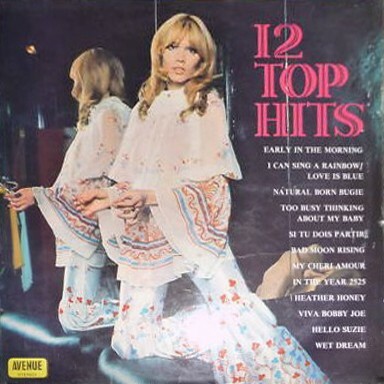 The cover for the LP shows the title as “Hits Hits Hits Hits Hits” but the spine and labels have “12 Top Hits”. 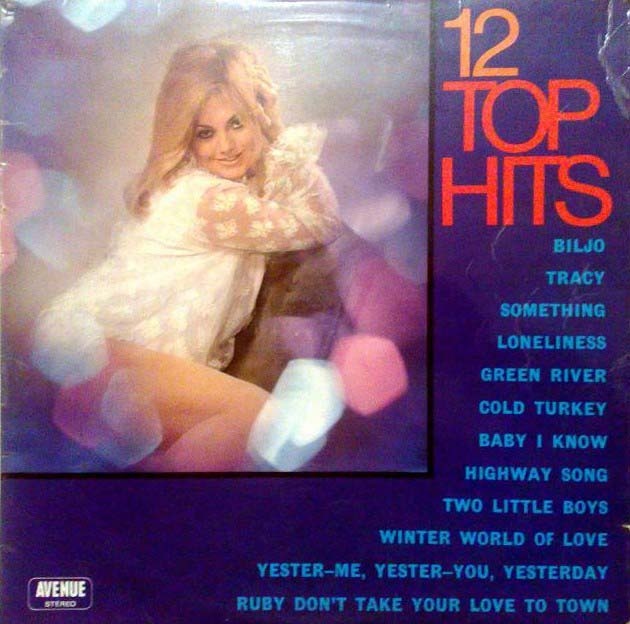 Comments: Title shown as "Twelve Top Hits" on the labels. 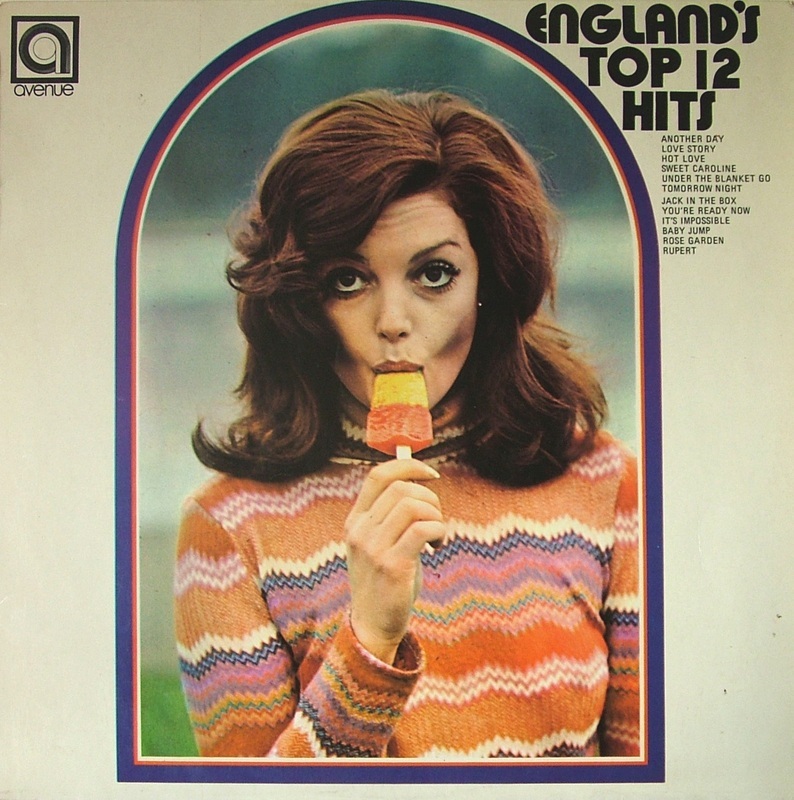 27 - "England's Twelve Top Hits"
28 - "England's 12 Top Hits"
Comments: cover model is Susy Shaw. 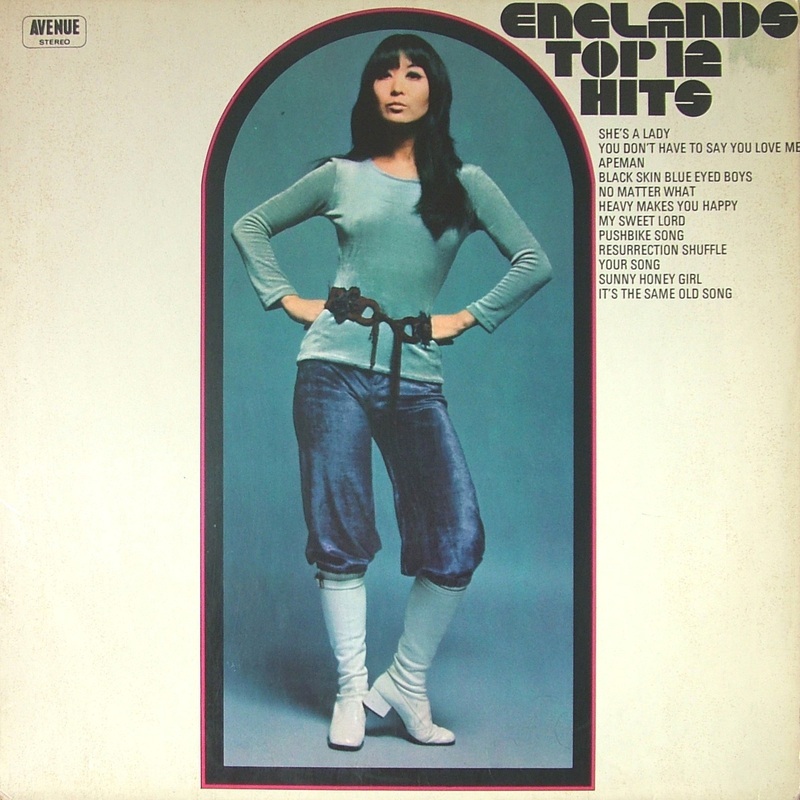 29 - "England's 12 Top Hits"
30 - "England's 12 Top Hits"
Comments: this LP was recorded but not pressed, due to financial constraints. 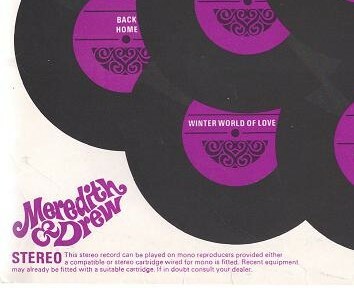 Five of the recordings would surface on the 1973 end-of-year LP (see below). 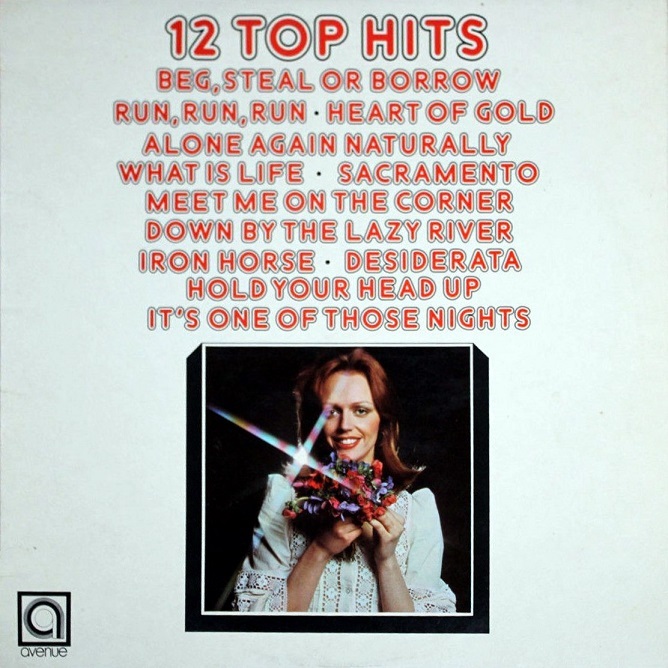 31 - "England's 12 Top Hits"
THE LABEL WAS APPARENTLY REVIVED BY ARTISTRY IN 1978 AND A NEW SERIES LAUNCHED UNDER THE NAME "SMASH TRACKS". SEE SEPARATE PAGE. Comments: Released on the Stereo Plus 3 label. LP is made up of hits from April and May 1973 and sits chronologically between AVE 0130 and AVE 0136, above. However due to its title and the different label, it cannot be considered part of the main series. Comments: Made up from twenty album tracks dating to 1969 and 1970. Released in conjunction with Meredith & Drew, biscuit manufacturers. The LP was available by mail order in return for a small fee plus tokens collected from biscuit wrappers. Remaining stocks of the album above were passed to Avenue and sold through retail channels. These copies have all the Meredith & Drew branding blacked out by hand (including on the labels thelselves!). See image for a genuine example. Comments: Released on the Stereo Plus 3 label. Contains five "new" tracks, not sourced from the main series: “I'd Like To Teach The World To Sing”, “Too Beautiful To Last”, “Mother Of Mine”, “The Young New Mexican Puppeteer” and “Amazing Grace”. Comments: Released on the Stereo Plus 3 label. Eight selections are from the main series, and another five are from the recorded, but unreleased, AVE 0139. 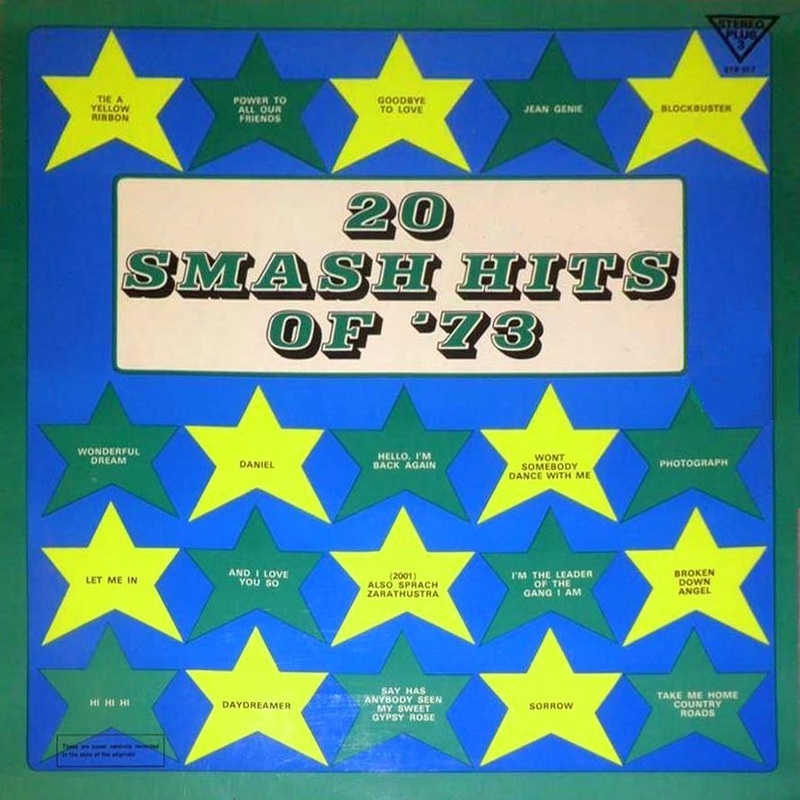 The remaining seven are from the Stereo Plus 3 album, "England's Top 20 Smash Hits" (see above).